Stonefalls is a zone in central Morrowind. 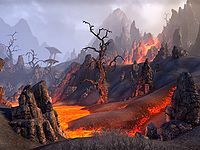 This diverse area features landscapes ranging from fungal forests to barren volcanic crags, and is home to the cities of Davon's Watch, Ebonheart and Kragenmoor. Stonefalls' geography varies from place to place, but it is mostly a hodgepodge of terrain from the surrounding regions. 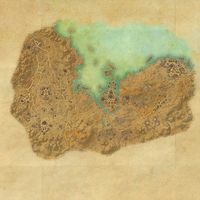 Daen Seeth, the easternmost region, is home to the great volcano Ash Mountain which is constantly erupting, and thus the surrounding land is burned and charred, but in the city of Davon's Watch, not far off from Ash Mountain, the land is green and hilly with fungal features, like the neighboring region Bal Foyen. Varanis, the western region of Stonefalls, is mostly a hilly, barren volcanic landscape. Another great volcano, the Tormented Spire, looms over the city of Kragenmoor in the southwest, but unlike Ash Mountain, it is not constantly churning out molten rock and lava. In northern Zabamat lies the Ebonheart Pact-controlled Fort Virak, which protects the border with Skyrim from the wild creatures of Stonefalls such as the ferocious Alits and Kagouti. Also in Zabamat is the Fungal Grotto, the base of the Murkwater Goblins and a hidden shrine to Mephala. In Zabamat, the central region of Stonefalls, lies the city of Ebonheart, which is home to a large population of Argonians, who are highly distrustful of the Dunmer living in the city. Quiet the Ringing Bell: Head to the heart of Daen Seeth to return the juggernaut to its cage. To Ash Mountain: Help the Pact troops at Ash Mountain. In With the Tide: Investigate reports of an invasion force washing up on the shores of Zabamat. To the Tormented Spire: Start your ascent of the Tormented Spire. Assisting Davon's Watch: Assist a besieged city. To Aid Davon's Watch: Assist a besieged city. To the Mountain: Help the Pact troops at Ash Mountain. A Higher Priority: Help the Pact troops at Vivec's Antlers. Taking Precautions: Inform Walks-in-Ash of the unstable wards at Tormented Spire. Darkvale Brews: Retrieve some stolen potions from a gang of Argonian bandits. Stem the Tide: Prevent a Covenant attack on Kragenmoor. Lighting the Shadows: Help the Fighters Guild stop the Spider Cult from raising an army of shadows.